One of my New Year’s resolutions this year is to make the garden even more pollinator friendly and for good reason. Just recently, the bumble bee was listed as an endangered species, becoming the first wild bee in the continental United States to gain federal protection. This breaks my heart because I have found bumble bees to be very social insects. Every year, Angie and I always have one that hangs out around the deck, and whenever we are outside he/she just loves to hover around us, probably chatting up a storm although we can’t tell. I’m sure it’s not the same one year after year, but it’s nice to see that they have the tendency to being friendly. So what do we do to protect them? And not just the bumble bee, but other bees, butterflies and other beneficial insects? The ones that pollinate the plants that provide us with food and hunt and destroy the bad insects that wreck unwanted havoc in the garden. Use a wide variety of plants that bloom from early spring into late fall. Help pollinators find and use them by planting in clumps, rather than single plants. Include plants native to your region. Natives are adapted to your local climate, soil and native pollinators. Do not forget that night-blooming flowers will support moths and bats. Bats?!! Yes bats. They are great at keeping the mosquito population numbers down and also love flies in their diet as well. Remember that annual flowers usually bloom all summer long while a good part of perennials bloom for a short period of time. Something to take into consideration when planning on what to plant and where. Avoid modern hybrid flowers, especially those with “doubled” flowers. Often plant breeders have unwittingly left the pollen, nectar, and fragrance out of these blossoms while creating the “perfect” blooms for us. There are a multitude of flowers that they love and remember the heirlooms when shopping for them. I have found in our yard they especially love lantana, zinnia’s, scaveola and sunflowers and you’ll find a multitude of insects on and around them throughout the day. Herbs such has the various mints, chives, lavender, and Mexican sage are a big hit as well. And don’t forget that a lot of those so called pesky weeds are very beneficial to our pollinator friends – especially clover, buttercups and dandelions. These ‘plants’ are sometimes the first ones available to supply them with the food they need. Eliminate pesticides whenever possible. If you must use a pesticide, use the least-toxic material possible, preferably an organic one. Read labels carefully before purchasing, as many pesticides are especially dangerous for bees. Use the product properly. Spray at night when bees and other pollinators are not active. And remember by hosting the beneficial insects they will seek and destroy those that you wish were not around. Include larval host plants in your landscape. If you want colorful butterflies, grow plants for their caterpillars. They WILL eat them, so place them where unsightly leaf damage can be tolerated. Accept that some host plants are less than ornamental if not outright weeds. A butterfly guide will help you determine the plants you need to include. 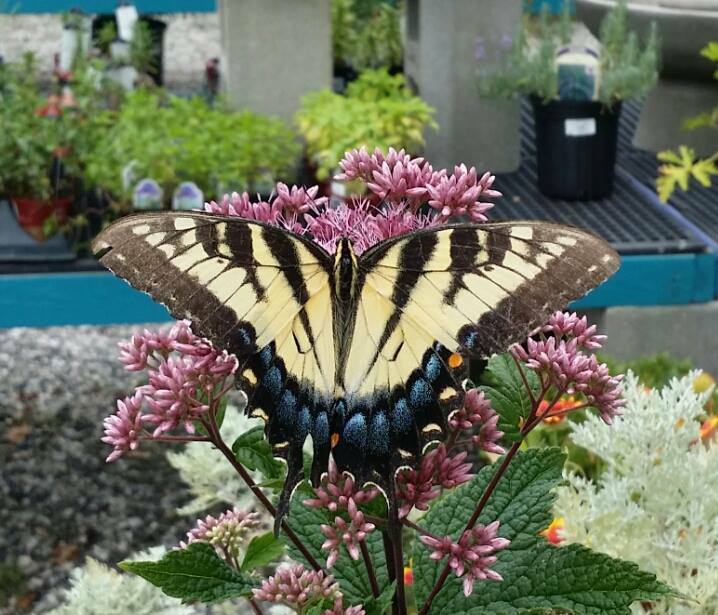 Plant a butterfly habitat! For the monarch, milkweed is essential. Create a damp salt lick for butterflies and bees. Use a dripping hose, drip irrigation line, or place your bird bath on bare soil to create a damp area. Mix a small bit of table salt (sea salt is better!) or wood ashes into the mud. Spare that limb! By leaving dead trees, or at least an occasional dead limb, you provide essential nesting sites for native bees. Make sure these are not a safety hazard for people walking below. You can also build a bee refuge by drilling holes of varying diameter about 3 to 5 inches deep in a piece of scrap lumber mounted to a post or under eaves. Google will give you multiple ideas if you search bee houses. I actually used an old small diameter wind chime for a mason bee refuge after I found them starting to nest in it. You can add to nectar resources by providing a hummingbird feeder. To make artificial nectar, use four parts water to one part table sugar. Never use artificial sweeteners, honey, or fruit juices. Place something red on the feeder. Clean your feeder with hot soapy water at least twice a week to keep it free of mold. Butterflies need resources other than nectar. They are attracted to unsavory food stuffs, such as moist animal droppings, urine and rotting fruits. 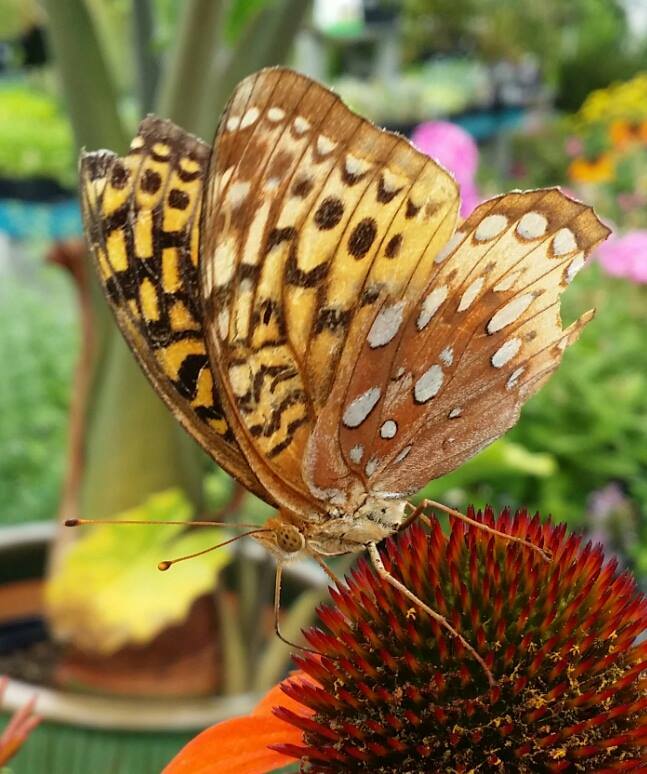 Try putting out slices of overripe bananas, oranges and other fruits, or a sponge in a dish of lightly salted water to see which butterflies come to investigate. Sea salt provides a broader range of micronutrients than regular table salt. And remember to plant butterfly bushes and milkweed in your landscape as well. 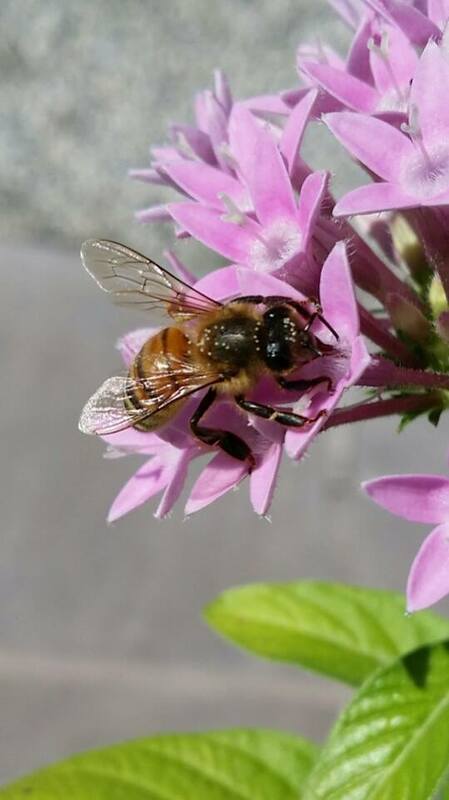 Learn more about pollinators. Get some guidebooks and learn to recognize the pollinators in your neighborhood. Experiment with a pair of close-focusing binoculars for butterflies, bees and humming birds. « Pet Insurance: What Are Your Best Options?